At present time most of the person uses Outlook for professional and personal uses for sending the mails. Sometime you send accidentally a wrong message to anyone and you realise your mistake. Now you want to know how to undo or recall sent message in Outlook 2013, who haven’t yet opened it. 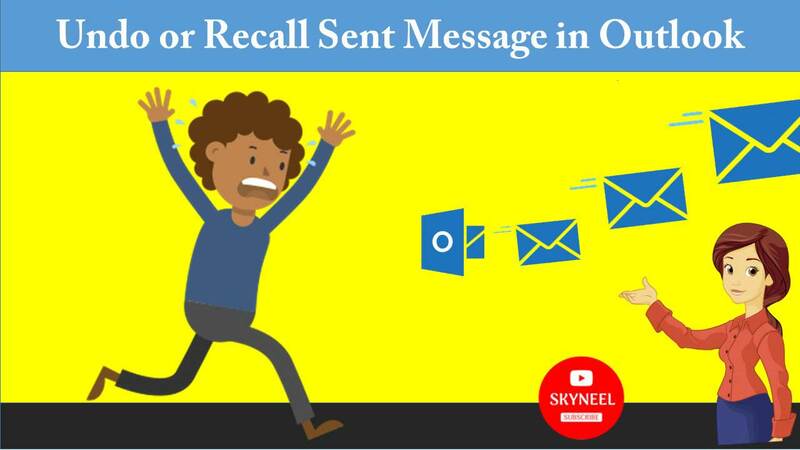 Most of person don’t know so in this tutorial will discuss how could you easily undo or recall sent message in Outlook 2010 or above version. With the help of message recall feature, a message that you sent is easily retrieved from the recipients mailboxes who haven’t yet opened it. You can also substitute a replacement message as per your need or delete the message. For example, if you accidentally send a wrong attachment or forgot to include an attachment then, you can try to retract the message, and then send a replacement message that has the correct attachment. Here’s is a quick guide how to easily delete, recall or undo your sent messages in Outlook with given simple steps. Step 1: Open your outlook program and go to your send message folder. Step 2: Double click the sent message which you want to undo or recall. This will open the message in a new window with different options. Step 3: Click Actions drop down arrow button in the Move section at the top center of the message window. Just click on the “Recall This Message…” option. This option allows you to recall a message that you have sent. Message recall can delete or replace copies of this message in recipient inboxes, if the message has not been read by the recipients. Step 4: In next box you will get two option. You can select “Delete Unread Copies Of This Message” option. Outlook will warn you if some of your recipients have already read the message, and you won’t be able to recall those messages. If you just want to add an attachment or ratifier the mistake, select “Delete unread copies and replace with a new message” instead. This opens a new window with your message already in edit mode so you can quickly correct your mistake(s). If you did not uncheck the box that says “Tell me if recall succeeds or fails for each recipient”. You should get a message from Outlook informing you of the status of your recall. Step 5: Finally click on the “OK” button. Now wait for Outlook to tell you if the recall had been successful. If recall process was successful, then message will disappear from your recipient’s inbox. If recall process failed, Outlook 2013 will inform about the failed recall process.